It’s a shame Wes Craven‘s most popular movies (“A Nightmare on Elm Street,” “Scream“) aren’t his best. Because a lot of people are missing great movies like “The Serpent and the Rainbow.” This one definitely trumps the popular ones already mentioned. The movie is set in Haiti, where Harvard anthropologist Dennis Alan (Bill Pullman) has gone to research a voodoo drug that could be used as an advanced anesthetic. What the serum actually does is make a person a zombie. It doesn’t make the person want to eat brains, but it does make them appear to be dead. Of course the military already has a hold of the drug and is using it to fight opponents. Dennis gets entangled in all of this and begins having drug-induced hallucinations. The nightmares are so vivid that he or the viewer cannot be sure if what’s happening is real or not. Dennis eventually realizes that the undead are actually being controlled by voodoo priests and if he isn’t careful, he could be next. I believe this is Craven’s best directing job. The nightmares, blood and gore in this one make “A Nightmare on Elm Street” look like a Disney movie. It’s genuinely scary, too. It takes us to a place and culture that we aren’t familiar with, so we’re allowed to believe these kinds of things happen there. We find ourselves being thankful that we aren’t smart enough to be a Harvard anthropologist. And Craven’s use of very common fears like snakes and claustrophobia aren’t just cheap tricks, they’re actually scary. 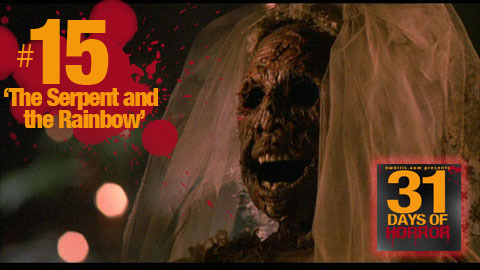 Best Scene: The zombie bride hallucination. It’s gross and scary in the simplest way. See clip below. Did You Know? Author Wade Davis, who wrote the book the movie was based on, agreed to sell the book rights on the condition that Peter Weir direct and Mel Gibson star. Neither man had any involvement in the project.